Back in November I found a sweet deal on a Vitamix Dry Blade Container, and it sold out within a couple of days. Now it’s back. This container usually sells for $144, but QVC is offering it for $50. Check out the sale: Vitamix 32oz. Dry Blade Blending Container with Recipe Book . 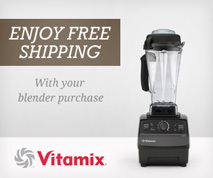 The product page has a message that suggests purchasing the container with a Vitamix machine, but last time around QVC had no problem shipping it alone. Shipping is $7.97. Apologies for the three shopping-related posts in a row, but they’re all time-sensitive so I wanted to get them up. I have some other content on the way; in the meantime you can browse the published recipes list. Note that this deal comes with a cookbook, but it does not come with a tamper. For most dry grinding you don’t need a tamper, so I don’t think it matters. It’s also true that if you have a tamper for any current Vitamix container except the Next Generation wide 64-oz container, it will work with this container. The main thing I use my dry grains container is for grinding grains to make bread. My current standby recipe is a sourdough rye. Having fresh whole-grain flour is great because stored whole grain flours can go bad due to the oil in the germ becoming rancid. Also, If you ever want to customize your flours (i.e. making non-wheat flours) you can save money by grinding them yourself. The dry blade also works slightly better for chopping hard vegetables into coarse pieces than the wet 3-inch blade because it pushes the pieces up away from the blades instead of pulling them down under the blades. Thank you; thank you; such a deal for the Vitamix dry blade container! Ditto the thank you. This I could finally afford. A wonderful money saving deal. been wanting this for awhile!! Great Mother’s Day gift to me! How do you get the discount price without also ordering a vitamix from qvc? I see it listed for $144. Did you try adding the linked container to your cart? The Vitamix purchase seems like more of a suggestion than a requirement. Les, you have to follow the link on Joy of Blending page. I just tried this and it is still available, through this link. I received my dry blade container today that I ordered on May 8. Thanks so much. Just got a Vitamix 750 and was cringing at the high price of the dry blender after spending so much money on the blender itself. I just got mine- be warned, there is no tamper in the shipment. The paperwork that comes in the vitamix box says it under parts and features, but when i called to ask qvc about it- they said it is not included. The second paragraph of the post discusses the lack of a tamper…. I just took the Vitamix plunge! I purchased the dry blade container from QVC for an amazing $50.00, and a reconditioned Standard Variable Speed from the Vitamix website. I can’t wait to receive them!! Thank you for doing the research and posting all of the great information. Thank you soooooo much for posting about this deal. I’m from Canada and had decided to indulge in buying a Vitamix after many years of dreaming. Your website helped me choose which one to get and on a visit to the US, I ordered the Pro 500 from the Vitamix certified reconditioned program and shipped it to a friend. This week my local Costco had a Vitamix promotion going on with a dry container at a special $99 price and I grabbed one, then went online that night to read more about how others are using it and found your posting on the QVC deal. Needless to say, I ordered one right away and shipped it to my US friend, and returned the Costco one. I just got a shipping notification from QVC, so the deal is still on. Thanks again!!!! Now to get the 32oz wet container at the $50 price. Just checked and the deal is over as of today. Glad I got one. Thanks for letting us know. I just updated the title to indicate that this deal has expired. Thanks,, ordered mine before it expired.. On it’s way. I took advantage of the QVC, thanks to you, Adam. Now I would like to get ahold of the 32 ounce wet container. I see no offers for deep discounts other then a vendor who is offering the wet container without led at about $89. My question is whether the same lid will fit both the 32 ounce wet and dry containers? Yes, it turns out that the deal described in this post is live again.